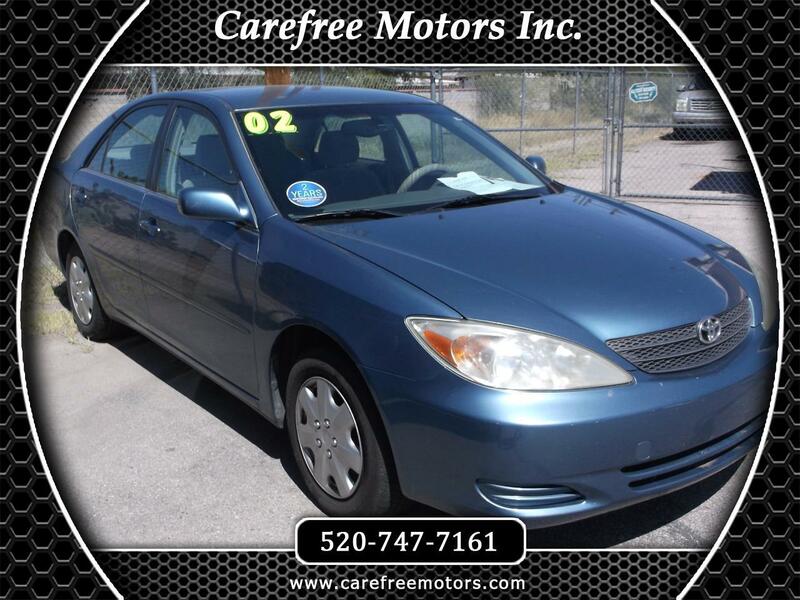 Used 2002 Toyota Camry LE for Sale in Tucson AZ 85710 Carefree Motors Inc.
Immaculate Condition! 2002 Toyota Camry LE 4 Door Sedan, 4-Cyl, 2.4 Liter, Automatic, Front Wheel Drive, ABS (4-Wheel), Air Conditioning, Power Windows, Power Door Locks, Cruise Control, Power Steering, Tilt Wheel, AM/FM Stereo, Cassette, CD/MP3 (Single disc), Dual Air Bags, Power Seat, Steel Wheels, Fuel City/Hwy 23/32 MPG 130,847 Original Actual Miles! INCLUDES 2 YEARS FREE LUBE OIL AND FILTER CHANGES!